A couple sketches for the whole month. 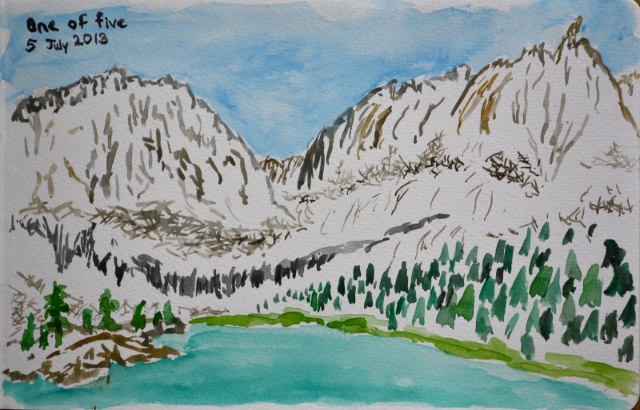 In the middle of the middle day of backpacking, on a spur into the middle of our loop, I found some time for watercolor. 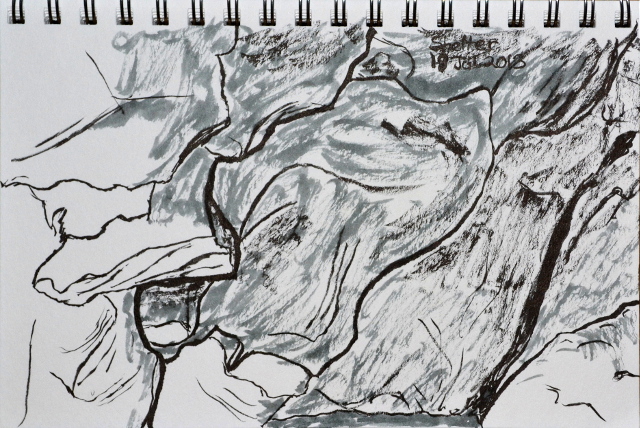 Resting from the heat in the shallow cave of some of the local sandstone, I traced some of the contours to paper. Today I went to the end of Alan Road to see if the green space there is accessible. It does not seem to be, so some wandering of Elings Park was had instead. 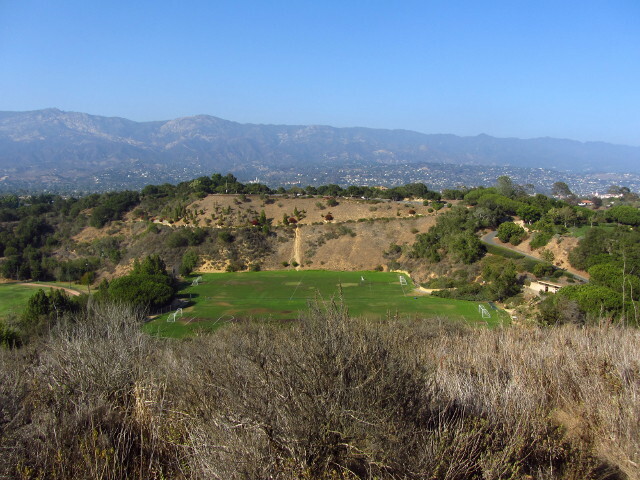 There are sports fields where I spent many hours playing AYSO soccer there on old landfill. Above that, there is a memorial and an area that often seemed to be dressed up for a wedding. Below it are tennis courts, a baseball field, and a couple BMX tracks. I didn't got to those parts. 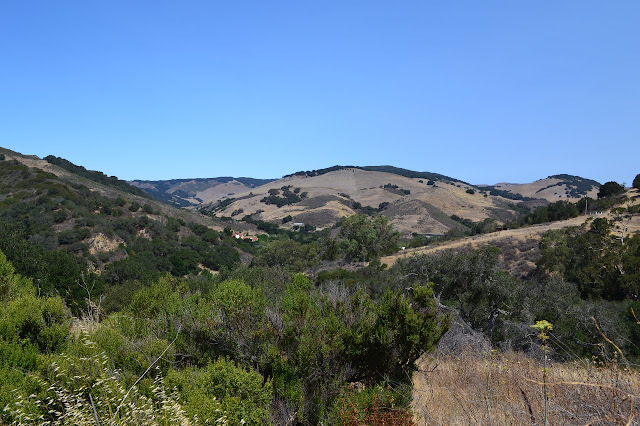 I went to the open space south of those where hang gliders practice and model airplanes fly. 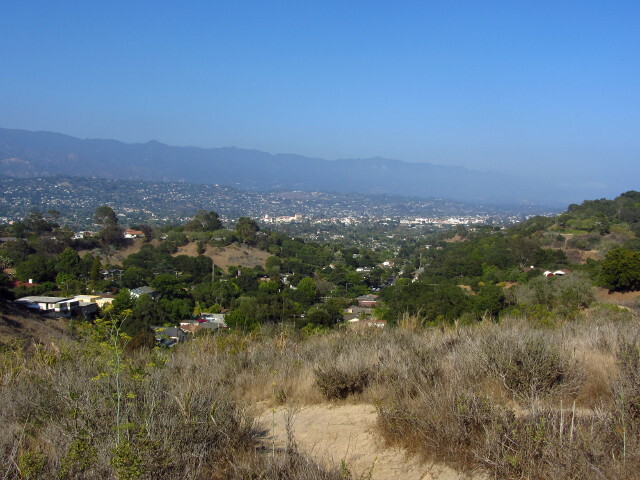 Trails meander up the hill and all over the top, offering views all over the city. Today was not a good air day, so it is hard to see some of that view, but there are plenty of hints as to what's out there. 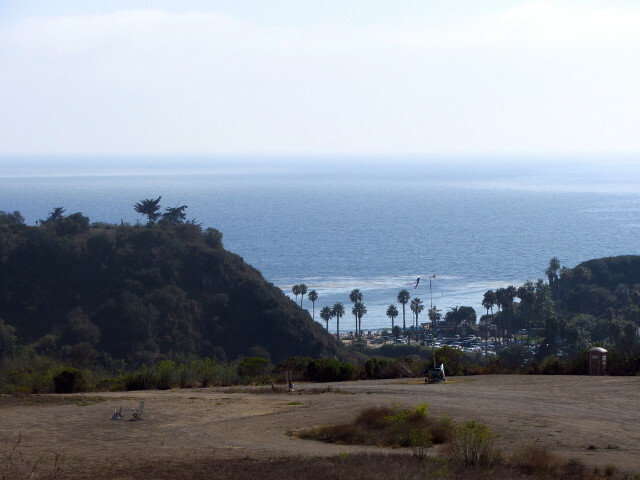 Just a little bit of the park open space and a glimpse of the parking lot at Hendry's (Arroyo Burro) Beach. The horizon should be dominated by Santa Cruz and Santa Rosa Islands. 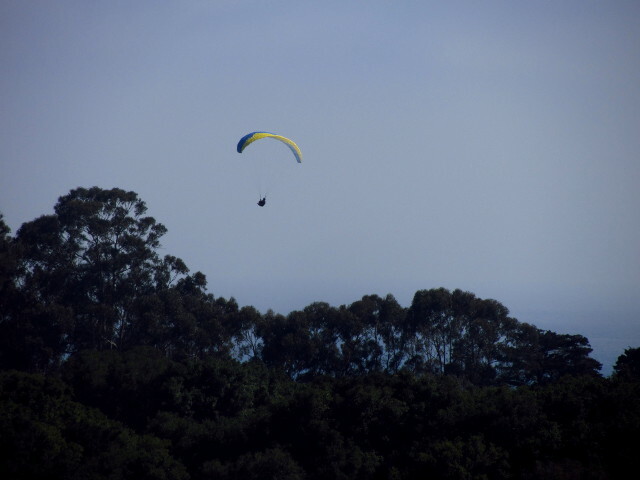 Hang gliders are a common sight, especially since part of the park is the practice hill. Today there was a paraglider riding a rather stiff wind. 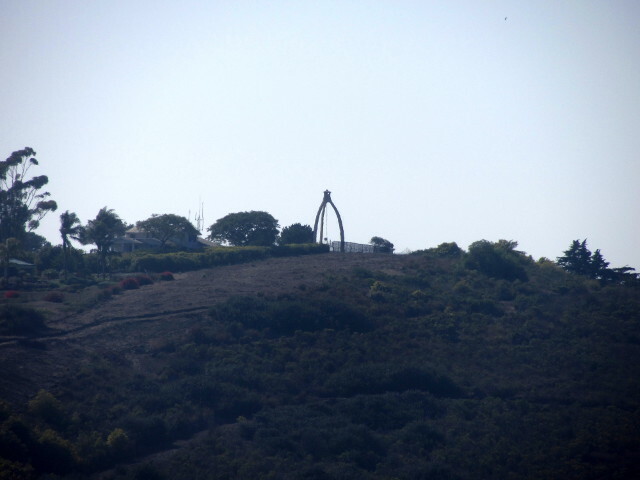 Across Arroyo Burro Creek at the top of the hill, there is what is apparently a bell tower that I wanted to investigate nearby. A couple benchmarks should be up there. To the northeast, the city makes its way into the hills. Downtown is a mass of white buildings with red tile roofs beyond. North, there are the sports fields with the city and mountains beyond. A little bit of the city park across the highway that we all found out about when putting a road across it came up on the ballot. There were people walking and riding bikes there and I can see a dirt road where the other was proposed. 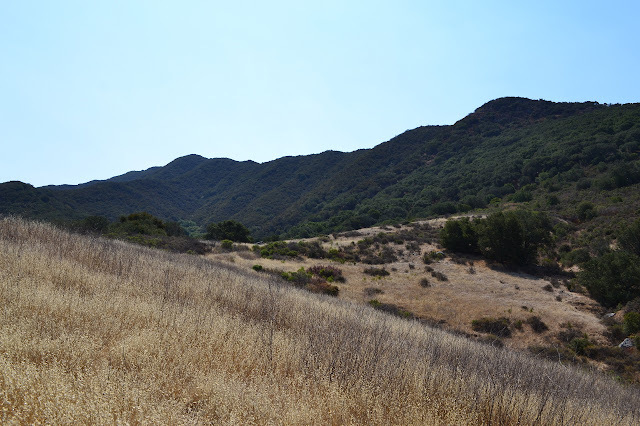 When I first hiked the loop to Gaviota Peak, I looked across to the ridge between it and the ocean and saw something that looked like it might be ruins at the top. I was informed by a frequent hiker of the area that they were not and better visibility and better zoom made it seem unlikely, although there is clearly an old road cut. The tinge of curiosity never quite went away and there is a very serviceable use trail along the road cut, so I decided to set out to explore it. I headed up and around the point and into the little lot for the hot spring and peak. Lots of civilization is tucked away in these hills. The freeway twists off to the left, a couple cell sites each with a couple towers stand upon the hills, and homes and a school are tucked into the corners. Starting up the hill, I am warned of mountain lions as I pass giant fallen oaks that are none the worse for it. The road soon splits offering the hot spring and peak to the left and Trespass to the right. I hang right for a short climb and there is a second split as a trail leaves. This one is marked by a short, small sign that once said "trail" along the vertical. Trespass trail continues to the left and Tunnel View takes off to the right. I want to try to make my way up the trail, so I take the right again. Looking up along the ridge line to the peak above. Day 5. I woke up and pushed aside a surprisingly dry bit of tarp to find there was already a bright and beautiful day going on without me. Eventually, I managed to overcome the pull of the Earth's gravity enough to get together breakfast and pack up. 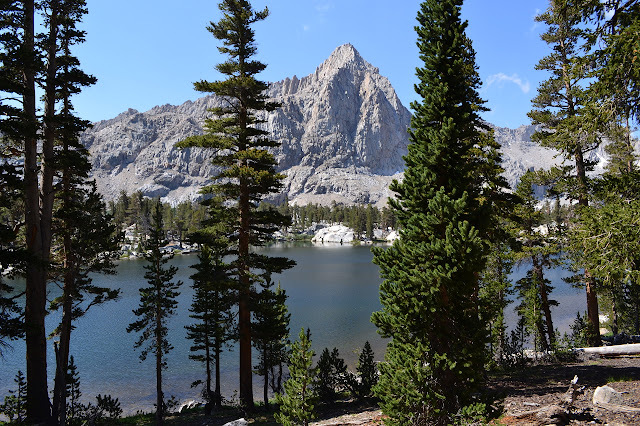 The original plan had two days to hike out from Forester Lake, with notes about how to go up to two 12k foot peaks that shadow Franklin Lake to fill out the day over the pass. We seemed to have decided to ignore the peaks and just finish the hike. Admittedly, I do usually leave the peaks alone. 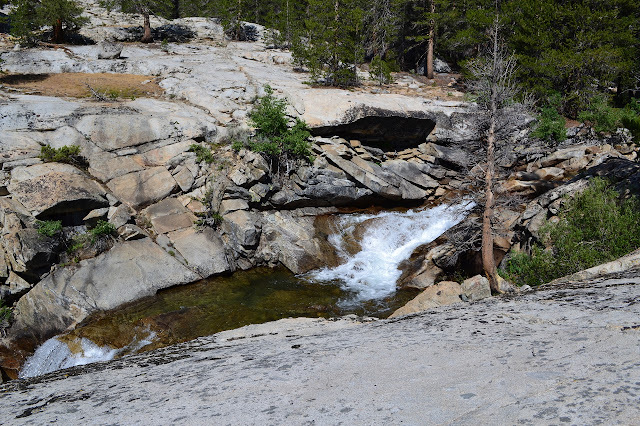 The day started with a gentle drop among a couple streams to Rattlesnake Creek. 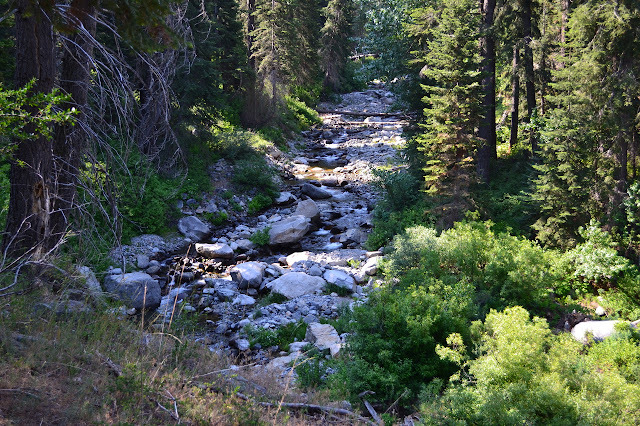 A small tributary to Rattlesnake Creek. After a very short "0.9 miles", we were near the creek and joined the trail coming up from Kern to start a fairly long "2.2 miles" as the trail climbs even more gently up. The area is green and somewhat open. We came upon a pack supported camp with one fellow just sitting out in the meadow by the junction with Shotgun Pass and then gradually start to climb more in earnest. We started to speculate about which notch or curve might be the pass. Well spaced trees stand away from the grassy creek bed of Rattlesnake Creek. Day 4. I woke up once in the night and pulled back the tarp to have a long look at the stars. The night was cool and nice and the stars exquisite right down to the individual points making up the cloud of the Milky Way. A typical Sierra sky. The tarp was covered in moisture on the inside, which wasn't surprising and wasn't getting on me so not a problem either. When next I woke, the sky was getting decidedly light. The tarp was still covered in moisture on the inside, but now I noticed that so was my quilt. A heavy dew had settled on everything. Feeling well rested, it was easy to start setting stuff out among our large, open kitchen rocks to dry and start in on breakfast. Today would be a long day with over half the climbing back out, but first we needed to hike another five miles down Big Arroyo to start that climb. 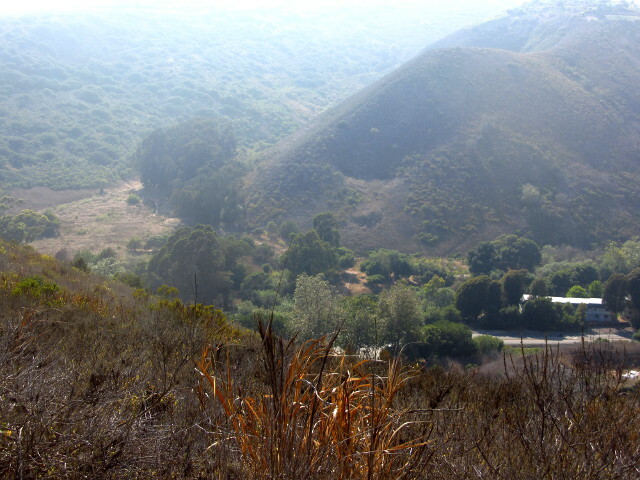 Big Arroyo in an easy corner down in the bottom of its valley. The trail continued to be easy to follow, except through the meadows. Most the meadows are small and it was quick to find trail on the other side and follow the slightly stomped grasses there. Many were quite wet and had a few trails making the way across in what different people had judged to be the best route given the boots they were wearing. I took advantage of mine being waterproof on a few occasions, but sinking in the mud deeply a time or two nearly got my feet wet anyway. One large meadow, we looked around and found two large cairns next to a bit of trail, but this just looped back onto the meadow again in ten feet. not seeing anything, I set off somewhat in the direction the trail pointed. Sung kept parallel with the creek and found the rest of the trail. Another meadow, I could see two trails and picked the high route. Sung went low and turned out to be right. Gradually, the trail dried out, and the trail seemed to be continuous and obvious. Somehow, it seemed to be going up and down a bit more than one would expect. Deciding I was too far from the creek, I abandoned the trail I wasn't liking and found good tread below. We'd gotten onto some animal trail without even noticing. We met no one on the way. Evidence showed stock had come through quite some time ago and many places had deep imprints from someone in a muddier time. For now, few seem to go by, we could see no footprints in the dirt and the trail was soft and wonderful under foot among the trees. Looking down on a spot where Big Arroyo starts to churn down through a gouge in the granite. 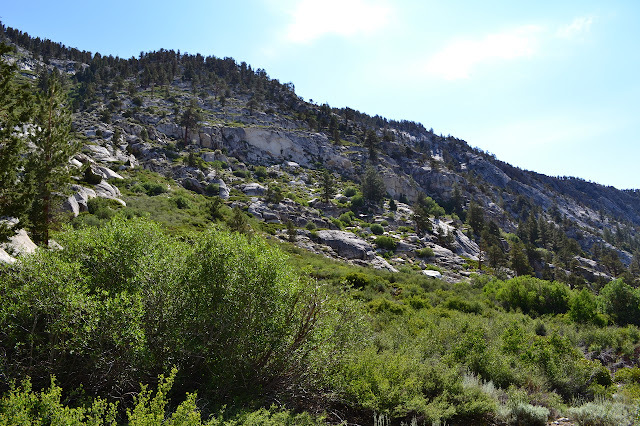 Trees and bushes along the granite walls of Big Arroyo. Some areas even have sages. Day 3. I still wasn't feeling like I should, but I was feeling better with a higher quality sleep. The thing was, we were way behind the plan. 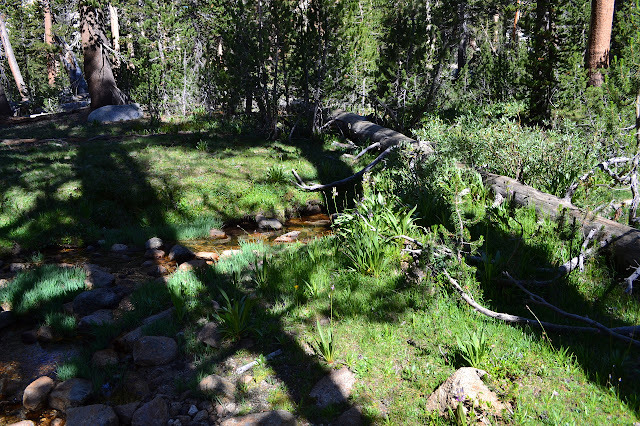 It may not have been quite as hopeless to head on down to the spring at 6k feet, a decidedly warm elevation, but it sure felt like it. We decided to let it go. 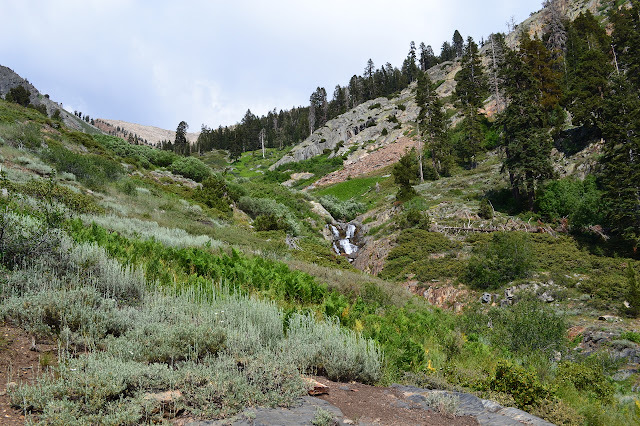 We would take the trail down Big Arroyo and catch our route up again at Soda Creek. Today would be a bit of downhill after a day hike over to the Big Five Lakes. 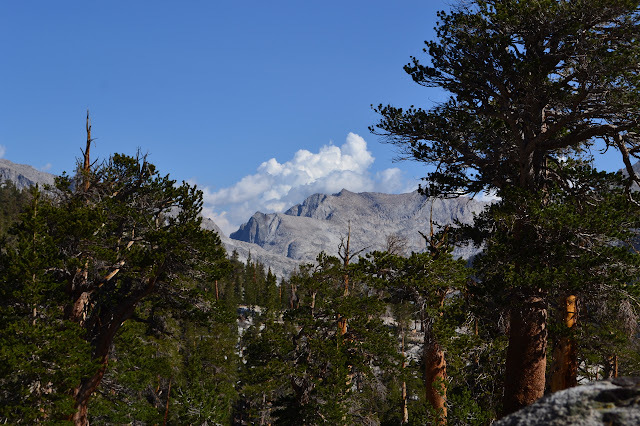 Clouds gathering already in Kaweah Gap, the last place the clouds hung on to yesterday. 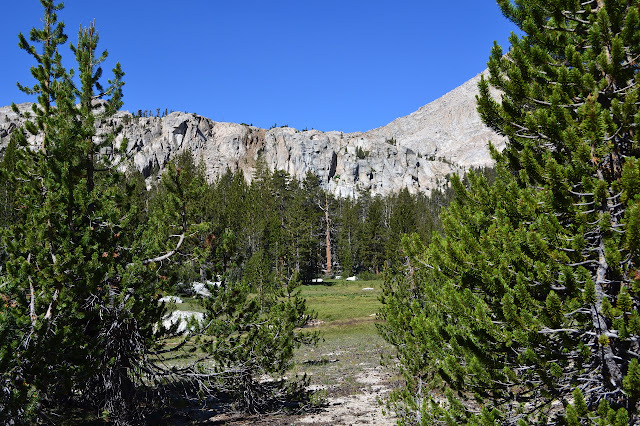 The trail around the edge of the short ridge that separates the Big Five and Little Five Lakes is well traveled and we met a few hikers along it. At least until the junction where a spur goes up to the upper lakes. No one else seemed to be coming that way and gradually the trail went too. At first, it just showed more signs of having to reroute around logs. It drops down to the first lake in short, steep switchbacks. It looks like camp spots have been established at this lake off to the left a ways. It then drops down a bit further to a larger lake. We came to another campsite and the trail seemed to stop. This may be what's left of a spur that goes around the lake a little way to the left that is shown on the map. We then found a bit more trail heading up. The signs of a well built trail are along it, but the trail itself dwindles away to nothing. I was expecting use trails to go further than the routes shown on the map, but instead it is hard to follow trail even that far. We settled by the third lake for a bit before turning back. The first of the Big Five Lakes that we came to. Day 2. The heat of sleeping at low elevations and the roar of Cliff Creek left me looking at the stars for far too long during the night. The lack of sleep didn't do anything to improve my speed as we started the day's climb from 7100 feet to 13700 feet at the top of the Great Western Divide. We had stopped just short of the crossing, which is more of a ford, but has some rocks for hopping. 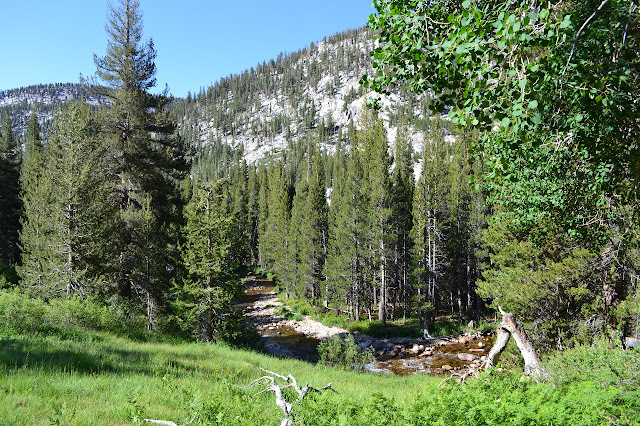 The junction is at the far side and came with a bear box and bigger, but slanted, campsites. We turned right and started up the canyon. Cliff Creek in a flatter area than we were listening to while trying to sleep. 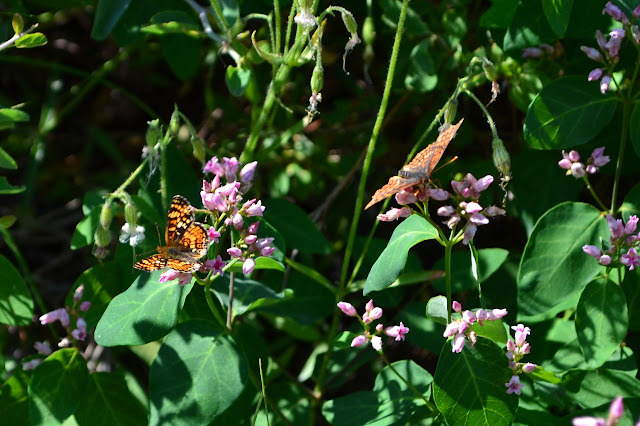 Of course there are always a few butterflies. A plan was set for a week of wilderness travel starting in Mineral King and taking three days and drop down into the Kern gorge to visit the fabled Kern Hot Spring for an evening, then take another four days to climb our way out over the Great Western Divide again by a somewhat longer route, maybe even hitting a peak or two along the way. The reservation was made and with seven days to the start, my sinuses started to take on that unmistakable feeling of coming down with a cold. I can deal with the tail end sniffles of a cold which should be similar to dealing with whatever mild allergy to something up in the Sierras it is that I've got. The fever, which I don't usually have with colds, set in by evening and more symptoms than I've ever had at once piled on over the next day. And thus sickness rose and dwindled while I was hoping to be getting ready for a few long days hiking at altitude. We set out to get to the trail by noon and with a rather dreadful navigation mistake and the congestion coming over the Grapevine, we were just in time to pick up our permit before the ranger station closed at 3PM and we wouldn't even have time to get up to the first planned campsite. The new plan was to camp when we hit Cliff Creek and then have two long days down to the hot spring where only one was a bit long before. We took a moment to scratch our heads at the various marmot protection measures for cars in the trail head lot and started up toward the short Timber Gap among a veritable plague of caterpillars. Plenty of water coming down the hillside off Sawtooth in Monarch Creek. The weather is looking threatening in that direction.